Adelaide bade farewell to another embattled older building this month with the demolition of the Frome Street home of the Rhino Room, The Howling Owl and Urban Cow Studio. 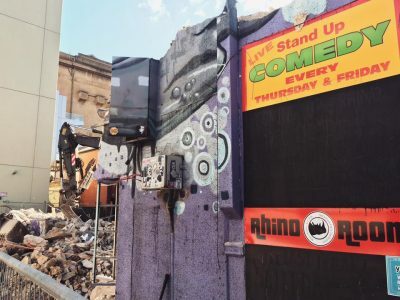 Best known as a comedy venue that has seen countless great Australian comedians from Adam Hills to Hannah Gadsby grace its stage, the Rhino Room has operated from the two-story building since 1998. It opened as a companion to Urban Cow Studio, a gallery and retail space which since 1994 has exhibited and sold a variety of work by local artists including iconic Adelaide creations like the famous “Heaps Good” t shirt. A later addition came in the form of café and gin bar The Howling Owl in 2012. All three venues were forced to relocate when the block of land housing the building alongside Eckersley’s Art & Craft were sold off by the University of Adelaide. Fortunately all three have managed to successfully relocate to new sites with the Howling Owl and Urban Cow shifting across to the Cinema Place precinct, and the Rhino Room migrating over to Pirie Street. Although the building dates to the 1850s, the former snack bar never received any heritage protection and is another example of the arts leading the way in finding new life and purpose for otherwise unappreciated older buildings. However, the recent demolition of the Gerard & Goodman building just around the corner is a reminder that even sites with noted heritage value should not be taken for granted. While the tenants of the former Rhino Room building have found new stomping grounds, it’s worth taking a moment to pay tribute to the building that provided so many artists and performers with a home for so many years and its contribution to the now-rapidly changing Frome Street streetscape.